The book is a music genealogy book; linking 1,550 bands/artists to The Beatles using the Six Degrees of Separation Theory. DELRAY BEACH, Fla. - March 19, 2014 - PRLog -- DTR Inc. CEO Jay Goldberg has written critically acclaimed books on entrepreneurship and work readiness training. However, in addition to teaching entrepreneurship courses and consulting to Workforce Development Boards (who have courses in work readiness); Mr. Goldberg teaches rock music appreciation and rock music history courses; including the course The Beatles: Six Degrees of Separation. 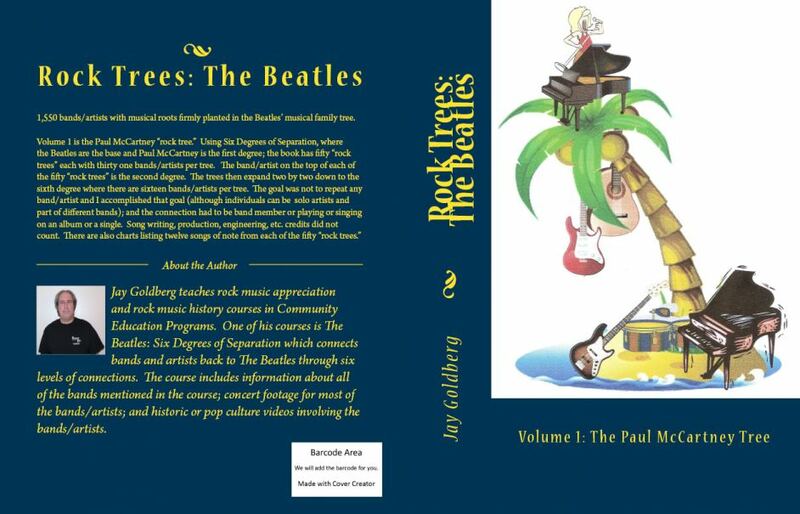 The positive reaction to the Beatles course led to Mr. Goldberg writing this book, Rock Trees: The Beatles. “Rock trees” is a play on words for family trees for rock artists/bands. The family (in this case musical family) connection used in the book was band member or playing or singing on an album or a single as a studio musician/singer or guest artist. Song writing, production, engineering, etc. credits were not used to connect bands/artists. The goal was not to repeat any band/artist, although individuals can be solo artists and a part of various bands. This book is volume one and examines the Paul McCartney “rock tree.” Using Six Degrees of Separation, where the Beatles are the base and Paul McCartney is the first degree; the book has fifty "rock trees" each with thirty one bands/artists per tree. The band/artist on the top of each of the fifty "rock trees" is the second degree. The trees then expand two by two down to the sixth degree where there are sixteen bands/artists per tree. In addition, each “rock tree” has an associated chart depicting how the bands/artists on the trees connect. Also included in the book are an index listing the 1,550 bands/artists with the page number of the “rock tree” they appear on; and a list of 12 songs for each of the fifty trees that the reader should be aware of or may want to check out. The book’s web page is: https://www.createspace.com/4580254. In terms of the future, three additional books for The Beatles are planned. Volumes two through four will have a “rock tree” for John Lennon, for George Harrison, and for Ringo Starr respectively. For more information regarding DTR Inc. visit http://www.dtrconsulting.biz.